I love Halloween, don’t you? I love the merriment, the costumes, the décor, and the treats! I always try to find a low-fat or low-cal treat for the neighborhood kids to enjoy when they come trick-or-treating – and that I can enjoy as well. 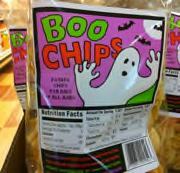 I have found an awesome and low-fat snack that meets the requirements for a trick-or-treat bag: Boo Chips. As much as I love Halloween and this time of year, the entire harvest season can wreak havoc on the waistline and spoil even the most determined dieter’s plans. Snacks like Boo Chips are perfect for those who want to stay “on the wagon” when all the good stuff is being passed around. I also think it is important to provide a healthy and less ghoulish alternative to those candy bars and other ooey-gooey goodies that kids are fed this time of year. Good nutrition can never start too early! Boo Chips are fun shaped little crisps (I’m not sure if it’s a bat shape or a ghost shape) that taste sort of like Pringles. Boo Chips are only 130 calories per one ounce serving and contain one gram of protein and no trans-fats and are cholesterol free (they are 3 weight watchers points). They’re also frighteningly delicious. One thing that I really like about Boo Chips is that they are made using safflower oil, which is healthier than other types of cooking oils. Safflower oil supplements, in fact, have been shown in research studies to promote fat loss. So using safflower oil in the manufacture of these chips is just downright smart – kudos to the guys over at Boo Chips for keeping our waistlines in mind! I would love to find these in single serve packages, but so far I’ve just seen the bigger bag that serves five. I found these at my local Whole Foods store, but I've also seen them at other specialty grocery stores.